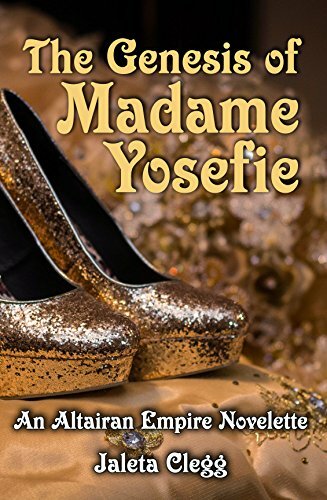 I'm excited to announce the release of a new story - The Genesis of Madame Yosefie. It's a novelette, so longer than a short story but not even close to a novel. Madame Yosefie was one of my favorite minor characters from my Altairan Empire series. I just had to find out who she was and where she came from, so I wrote her back story. It's a fun romp with plenty of intrigue and plotting and fight scenes. It's only 99cents so grab your copy today! All she wanted was to share her fashion sense, but what Jojo got was involvement in political scandal and assassination attempts. Jojo came to Linas-Drias with a dream—to share her sense of fashion and beauty. But the closest she can get to high society is as a janitor cleaning the floors of the VIP space lounge. Until one night, she overhears a plot to assassinate political rivals and finds herself entangled in a web of deceit and espionage with the mysterious Commander Lowell. An Altairan Empire prequel story.